The younger generation of future graduates were given a taste of university life this month as they took part in an 'Aspiring Ambitions' event. 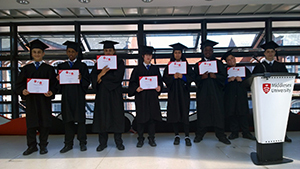 Around 800 students from schools across London took part in the event at Middlesex University throughout June, aimed at aspiring teenagers to aim higher. The day finished with the students donning a gown and mortarboard and graduating from the University. During the one day event, the pupils took part in a number of interactive activities including planning a family day out in London on a budget, creating their own university society, and examining what university life has to offer. They also took a behind the scenes tour of the University and got a chance to try out some of the facilities. Tommy Baxter, Gifted and Talented Coordinator from Greig City Academy, who took part in the event, said: "It is events such as this that are great at building up our students aspirations and showing them exactly what is available once they leave school. "The students really enjoy coming to the university campus and it's empowering to see how the classrooms, art studios and lecture theatres inspire them as they begin to think of embarking on higher education." Middlesex University's Education Liaison and Outreach Manager Elita Eliades-Ahmed said: "Aspiring Ambitions is one of our longest running outreach events, and it's always a pleasure to see how the talented students work together to come up with innovative and creative ideas to solve the activities."